January 8, 1976 — November 30, 1978 Liberal Democrat, state legislator, elected by broad progressive coalition of minorities, gays, leftists. 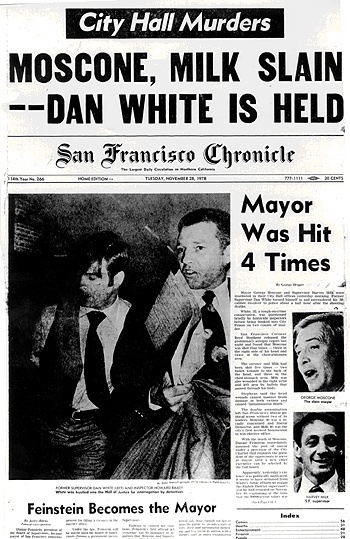 Assassinated by ex-supervisor Dan White in November 1978 along with gay supervisor Harvey Milk. Two weeks before Christmas in 1975, the City seemed a better place for low and middle income renters. 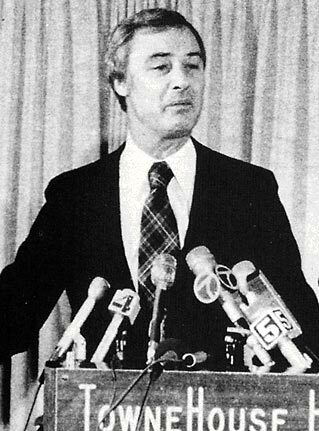 A few hours before the fire, George Moscone had won a runoff victory over realtor John Barbagelata, becoming San Francisco's thirty-seventh mayor. In a deepening climate of racial, economic and geographic polarization, Moscone's 90% margin in parts of the Fillmore, Hunter's Point and Bayview had overcome his challenger's 70% tally in many southern and western precincts. Watching from the sidelines was then-supervisor Dianne Feinstein, who had trailed badly in the first election and, in the opinion of political observers, was considering a career in the private sector. Developers, who had turned to Barbagelata after Feinstein's stumble were, by 3:43, sleeping the sleep of the dead as were the victors, fresh new faces such as Moscone-backer Alan Wofsy and the new mayor's law partner, Charles O. Morgan. And while the movers and shakers dreamed of castles, sugarplums and HUD block grants and losers schemed of campaigns yet to come... Herb Caen would be touting mayors-in-waiting Kevin Starr and Fred Furth within the week... ordinary people dreamed their dreams of jobs and families and maybe better times to come in a nation moving slowly out of the corrosive stench of Watergate and still-smoldering hell of Vietnam. Good Gerald Ford lacked some of JFK's charisma and the tortured majesty of Lincoln, but he wasn't Nixon either. Two assassinettes had missed the lucky President. Trials were in progress. And F. Lee Bailey, lawyer for the Hearst pup who had robbed her daddy's rival's bank explained the violence and cynicism in his proud exterminator's logic, sweeping the decade and its corruptions into the dust like so many dead cockroaches. "Physical coercion," Bailey thundered. "Threat and fear of death. That will be our defense to the robbery of the Hibernia Bank." And at the Golden Gate, Clint Eastwood was serving up a double dose of threat and fear in Magnum Force and Dirty Harry while at the Roxie, diagonal to the Gartland, Anna Karenina by the Bolshoi delighted the eggheads (no subtitles!). And there were Russians coming in the flesh... gymnasts Olga Korbut and her crew. Detente! The first place Warriors, behind Jamaal Wilkes and Rick Barry had trounced Portland to move a game up on the hated Lakers. Hamburger on sale for $.69 a pound. Sue Hestor: “The '70s was finally when Moscone was elected, there was an acknowledgment that people in the neighborhoods, people in communities, not just people in neighborhoods but broad-based groups in the city, could make decisions. And that was the main part of the Moscone Revolution that really has semi-stuck. Up until Moscone, the Aliotos, Shelleys, Christophers, all long before I was here, basically went to a fairly narrow segment to put on commissions. They put on business people and people that represented the old boys. They were virtually all men. I can remember the real exceptions: they would allow a woman on social services, and Julie [Four] on Planning, she had kind of a lifetime Planning Commission appointment, and I think there were maybe four women commissioners in the Alioto administration. There was no woman on fire, no woman on police, no woman on civil service. And one of the things that happened when Moscone started his process, which has been implemented in a flawed manner ever since, was opening up of how you put people on commissions. And it was an acknowledgment of this fact for a lot of people. Because the Commissions started looking like the people of this city because women were appointed, gays were appointed, blacks were appointed, more than just a token number though they were scattered very thin, and the same with the other ethnic minority communities. So there was a political statement that George [Moscone] made which was very important, and we had district elections on the ballot the following year, and we won. And we went through the repeated repeal before it was implemented, and we beat that back. We had our "No on A" campaign which was in 1978, and then we have Dan White and that took the steam out of district elections, as well as we lost district elections to a great extent because people had a hard time sorting out the politics of whether district elections had promoted unstable politicians into elected office. But obviously we have a lot of unstable people and you don't need district elections for that.